On Friday morning, a few excited CNN staffers started tweeting some silly photos. 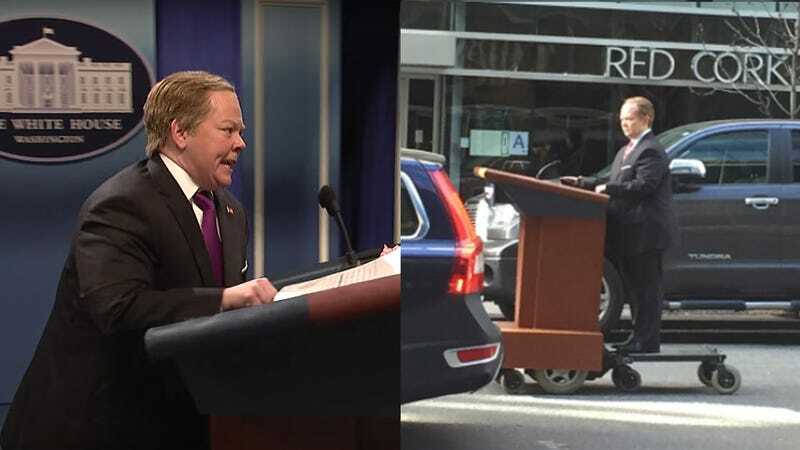 Melissa McCarthy, costumed as Sean Spicer, was riding her motorized White House lectern around the street in front of the network’s offices. Why? We’ll give you one guess. Filming the skit in front of CNN is especially rich. CNN, of course, is now Donald Trump’s least favorite network, and one of several networks that were initially barred from White House press briefings with Sean Spicer. CNN is also the original gangsta (OG) “fake news” organization, according to President Trump, even though CNN is very much a real and largely respected global news organization. Another fun thing about the Spicey-mobile spottings in Midtown on Friday is that we get a close up look at what’s going on behind the lectern. The motorized vehicle is reportedly a repurposed motorized wheelchair. The news organization that reported on the Spicey-mobile? CNN, duh. Can’t wait to see the skit and laugh at the downfall of American democracy live on Saturday night!